In the final days before the U.N. Climate Change Conference in Copenhagen, the intensity of rhetoric has been unrelenting. Inevitably, the science that got us to this moment takes a back seat: the world’s policymaking apparatus is now steering. The people who feel the most helpless in this process are not scientists, though. They may very well be politicians. Or at least, that’s what the government of the Republic of Maldives, desperately wants us to know. Living at an average elevation of just 5 feet, their population has every reason to be concerned about projections of sea-level rise. Swamped with official business in the Maldives. in October and communicated 16 feet beneath the ocean’s surface using hand gestures during a protest of the U.N climate summit in Copenhagen, which the Maldives claimed was too expensive to attend. 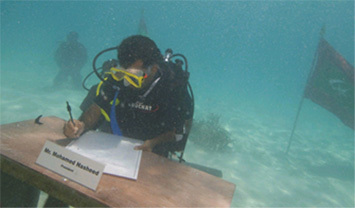 During the underwater meeting, the Cabinet signed a declaration calling for global cuts in CO2 emissions, to be presented at the Copenhagen meeting. Excellent piece! Sensational writing! Concise focus like a lazer! I can’t wait for an update.